It was Saturday October 10, just before seven P.M. when I pulled my car up to the meeting place. There was still a little daylight left but it would be dark soon. We were to meet near the picnic area at Bushy Run Battlefield in Jeanette, Pennsylvania. 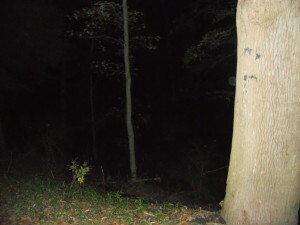 Mike Hildebrand is the founder of Point Paranormal and also volunteers as a tour guide at Bushy Run. 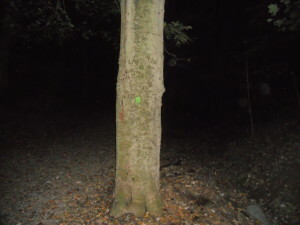 His wife Clarese, also a member of the paranormal group, was with him. Mike took me aside and gave me the history of the site, which he normally does over two hours, in about ten minutes. I don’t think he took a single breath. Bushy Run was a battle that took place in 1763 during Pontiac’s war. Pontiac was a leader of the Ottawa Indians. He was upset because the British were taking back land the French had given to the Indians, which of course was the Indians land to begin with. For the first time in history the Indians were attacking, which took place here. Fort Pitt was under siege and Colonel Henry Bouquet was leading a group of relief troops from Fort Ligonier. The forts were separated by forty miles and it would take three days to make the trip. Today with automobiles you can make it in about half that time, depending on what kind of construction nightmare Penn Dot has going. Bushy Run served as a way station along the trail where British soldiers could rest and pick up supplies. They could also fill their canteens with water, which was necessary being the battle took place in early August. There would be a group of boy scouts joining us for the paranormal hunt I was informed. Nothing against the scouts, they’re a great group and these were all nice kids, but it’s the age. Boy scouts are between eleven and eighteen. You know, teen age boys. The only thing louder are teen age girls. Sorry ladies, but you know it’s true. I could see by the way his wife looked at him he would probably catch hell later, but so what? I wouldn’t be there. 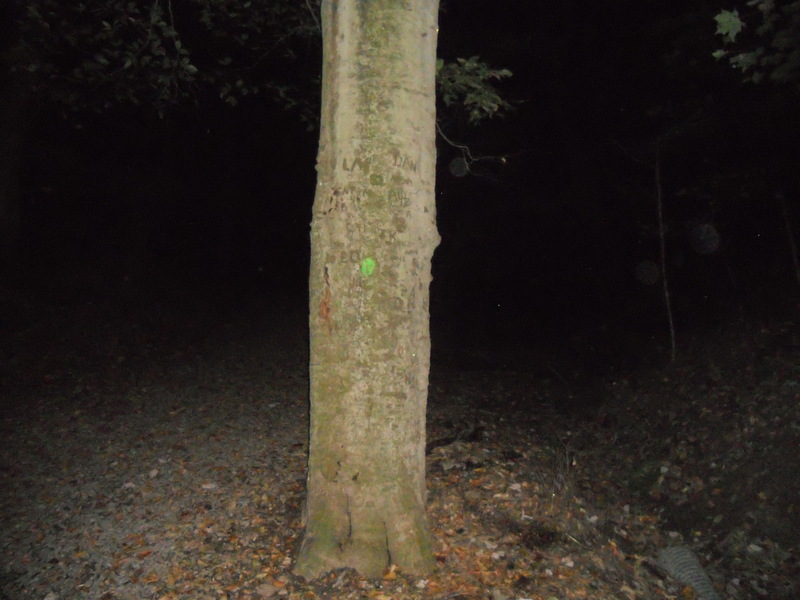 We walked up the hill to our first spot, a monument where part of the battle had taken place. Mike explained that when he goes on an investigation, he is trying to come up with logical explanations for experiences people may be having. One of the devices he uses is a combination of an EMF (electromagnetic field) detector and temperature gauge. There is a belief that spirits give off electromagnetic energy and can also affect temperature. These are two British soldiers that were killed in the battle. It went to fifty. I decided to get involved. I placed my water bottle on the bench to use as a trigger object. I know about this because I watch the shows on TV. With the temperature dropping six degrees that quickly, you should feel something, but it felt exactly the same as when we arrived. Everything stopped at that point. Mike had been taking pictures during our time there. Nothing unordinary on all except one. There were no lights and he wasn’t using a flash, but on one photo a stream of light appears on the ground in front of us. Next we went to the burial grounds. It was down the hill in a valley. The temperature felt colder here but the meter said 54 and stayed there. Nothing really happened in this area. I took some photos that I didn’t look at until I got home. More on that later. Our next stop was the memory trees. They are called that because they have been standing since the battle took place. Along the way we crossed paths with the other group. It was dark but you could hear them coming. Remember, teenage boys. We didn’t get anything at the memory trees, or so I thought. 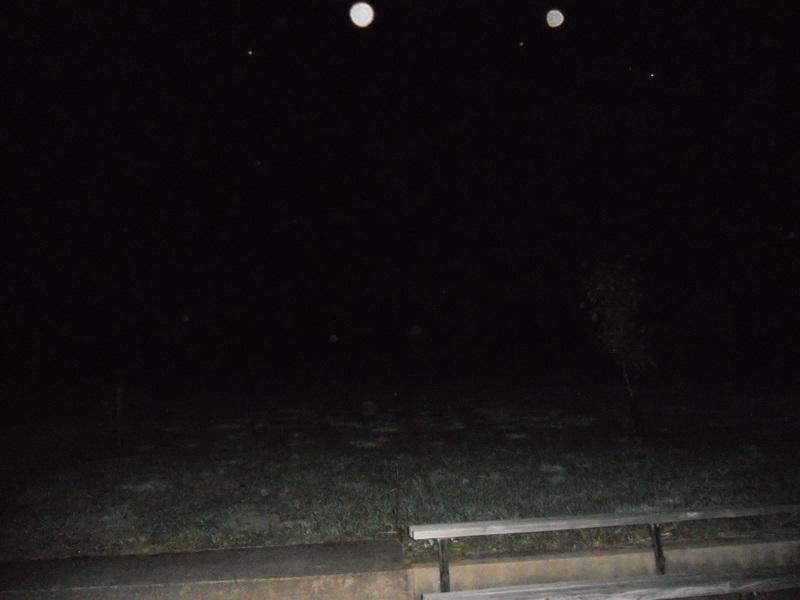 Again I took some pictures and when I got home and looked at them I noticed some orbs. 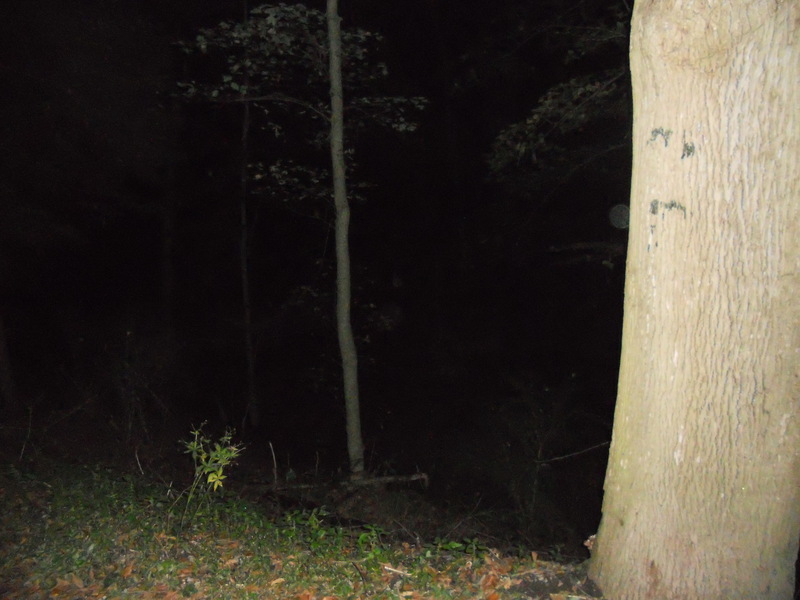 I also had orbs in the photos from the burial grounds. 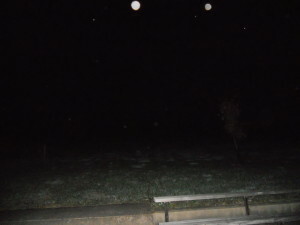 Some people believe orbs represent energy from spirits. Mike’s attitude is that, although they are interesting it’s not proving anything. All I know is I’ve taken countless photos on that camera and this never happened before. There was once a farmhouse on the grounds, after the battle and before it became a Historic Sight. The recording was made where the house once stood. You hear Judy talking with her daughter and in the background a woman singing to a baby. The woman wasn’t there. I had forgotten about it, but here it was happening. It started at 50.1 to 50.2. Then it would stop. I still had my bottle of water so I placed it on the table. I left my water. I didn’t need a ghost following me home and wreaking havoc with my thermostat. Not for a lousy bottle of water. I had another one in the car after all. Special thanks to Mike and Point Paranormal for letting me tag along. You can check out their website for footage from that night. Special thanks to thank Bill Wilkins of paranormalsocieties for sending my name your way. I would also like to thank TJ at huntparanormal and Ghost’n’at for getting in touch. Sorry our schedules didn’t mesh but I’d still like to go along some time.